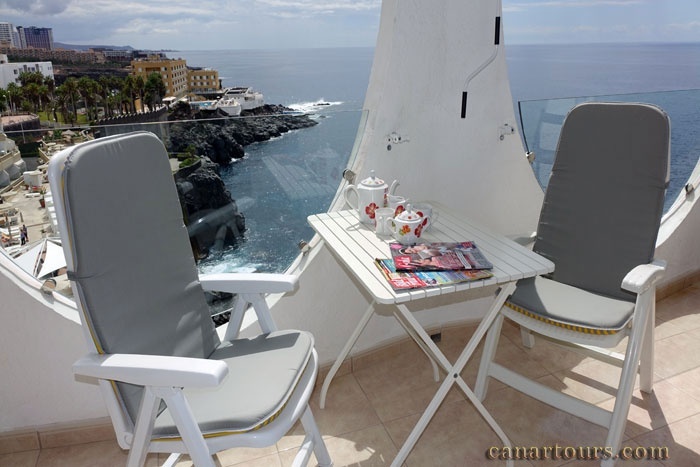 The apartment El Ancla is located in Callao Salvaje, on the seafront and offers a fantastic view of the Atlantic Ocean and due island of La Gomera. Closer to the sea you can not live. A rental car is not necessary, because restaurants, bars and shops are within walking distance. The apartment has 63 square meters of living space and is divided into kitchen, bathroom and 2 bedrooms. The apartment is bright and modern furnishings. The Atlantic can be seen from every window. The balcony is facing south and offers almost all day sun. The kitchen is equipped with all important utensils and appliances like Nespresso coffee maker, toaster, kettle, microwave, oven and large fridge. The bedroom asking beds in the size of 140cm x 190cm and 130cm x 190cm. The living room has a comfortable, large sofa and a TV with satellite antenna to receive international radio and television programs. The table asks accommodate 4 people. The bathroom has a shower, bidet and washing machine. There is a large community pool at your disposal. There is also a smaller pool for children. Towels, linens, iron and ironing board are present. Out of consideration for our Non smoking guests, smoking in the interiors is not allowed. Price: The daily price for 2 persons is 59 €. Each additional person pays 15 € per day to do so. The final cleaning is one days rent. Callao Salvaje is located on the southwest coast of Tenerife , not far from the resort of Playa Paraiso. It is one of Adeje . The place is very quiet and serene. The coast of Callao Salvaje is mostly steep and rocky. But there is a small bay with sandy beach. It is one of the few places where the sun is guaranteed 360 days a year seems . One can find countless restaurants , bars, banks, grocery stores, etc. It is the perfect place to for people who want to escape the mass tourism.